Can Video Games Increase Your Child’s Grades? As parents in a high-tech society, we face issues that our grandparents and even our own parents never gave a second thought to. One such issue is the “problem” of video games, specifically how much is too much and what types of games our kids should be playing. As the sheer number of games and consoles increase at a seemingly exponential rate, these questions are becoming more and more important. Some studies have suggested that certain types of video games such as those that require memory, problem-solving, and spatial intelligence (i.e. puzzles and mazes) can actually increase brain function, IQ, and academic performance. Although these studies have not been able to definitively correlate these types of games to above-average grades, it stands to reason that if a child finds a game mentally challenging, learning is indeed taking place. You can find an array of free brain-training games for kids at sites like www.kidsmemory.com and www.smileygamer.com. 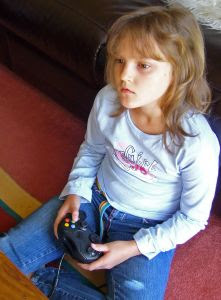 A 2009 study performed by the American Psychiatric Association (APA) revealed that playing video games could increase the ability to focus in children with ADHD. While that doesn’t necessarily mean that this skill will transfer when kids are presented with less stimulating tasks such as writing an essay or solving an algebra problem, it may mean that students with attention deficit problems who play video games for a short amount of time each week could potentially perform better at school when listening to a teacher present an interesting lesson or completing a hands-on activity. Since high-interest activities are becoming more widely accepted in public schools as effective teaching strategies, this increased ability to concentrate on engaging or interactive tasks could definitely pay off on report card day. In addition to improving focus and cognitive function, some types of video games can have some practical benefits as well. Young children, for instance, can increase their fine motor skills by clicking on objects with a mouse or even selecting an item on a touchpad. School-aged children can benefit by learning to follow directions or practicing the skills they’ve learned in school such as math and reading comprehension. The bottom line? While video games can’t be solely relied upon to boost your youngster’s academic performance, certain types of games can play a key role in developing and maintaining good brain function while providing kids with the opportunity to acquire and practice skills in a way they find meaningful and fun. Of course, not all video games are alike. Before prescribing a regimen of games for your son or daughter, be sure to do your own homework first to ensure that the time you allow your child to spend playing video games is time well-spent. Above all, make sure that you have a reliable software program like Qustodio installed on your computer to ensure that the games your child is playing are not only educational, but safe and age-appropriate as well. Previous Post7 Practical Ways To Keep Your Kids Safe Online Next PostDo You Know Who Your Kids Are Talking To Online?